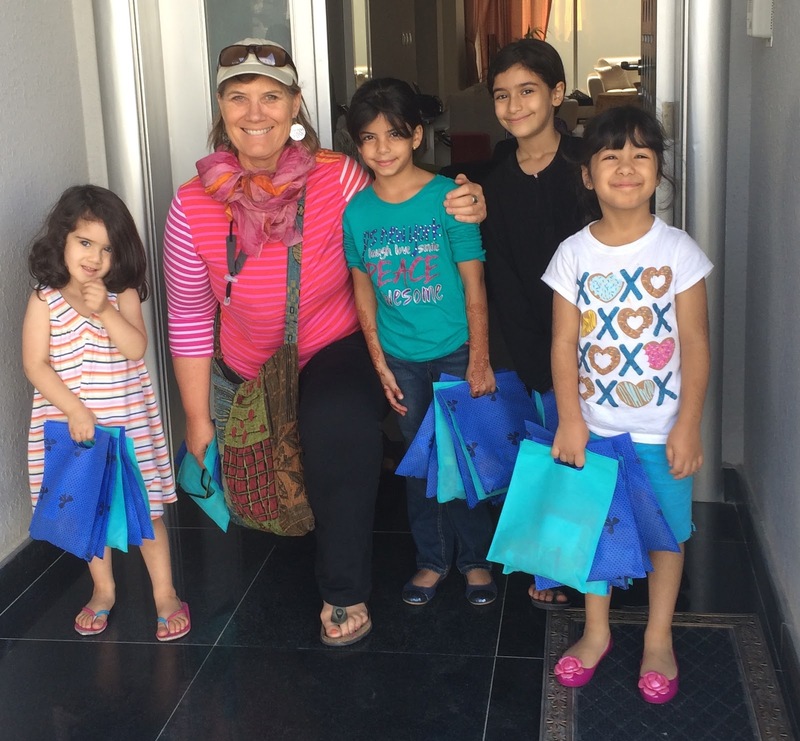 Here are some of our young neighbors delivering bags of small toys and treats for Eid. Their moms told me they had been waiting for weeks to visit neighbors in our compound. It was Halloween--in reverse! 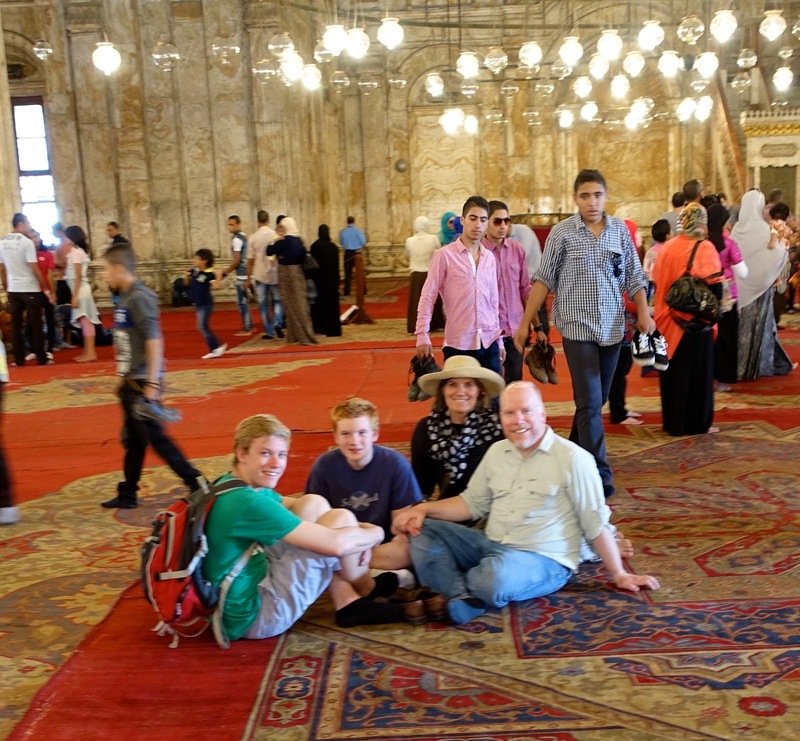 We were in Qatar for the prelude and first day of Eid, and then we traveled to Cairo, Egypt since the boys had the week off of school. Here is an Eid wish the children were delivering in their bag. It is a curious thing to be in the Middle East during a religious holiday watching from the sidelines--especially if you are the type who enjoys reveling in festivities and celebrations. Although I am strong in my own faith, I enjoy trying to get a front row seat in the audience to view others' rites and rituals. I have seen much beauty and light in the Middle East as I observe heartfelt yearnings to pray, touching family relationships, and giving freely to the poor. It gives me pause for inspiration--and even some awe. Eid al-Adha is the second Eid, the feast of the Sacrifice, and it commemorates Abraham's willingness to sacrifice his son, Ishmael, as an act of submission to God. It is celebrated with the giving of presents and money to children and family. Everyone cleans and washes themselves as a purification ritual for the occasion. Preparation for the holiday means buying new clothes to visit relatives, and even trying to go back to the ancestral home. Also, Eid Al-Adha is when Muslim pilgrims descend on Mecca, Saudi Arabia for Hajj. In 2014 there were 2,089,053 pilgrims who came from all over the world-- a journey that is required of the faithful. Children reenact Hajj, just as Christians have Christmas nativity pageants (see pictures below). Many families ride on scooters, even five at a time, around Cairo. Everyone was traveling somewhere to visit their relatives--any way they could get there. Since Allah spared Ishmael's life and replaced it with a lamb, animals are slaughtered to eat with family, and given to the poor. Cows, sheep, goats, rams, and camels are killed to remember the sacrifice of Abraham. It is intended that one who an has abundance and/or perhaps has been given more temporal blessings that year, gives more bounty to the poor. Here are two boys in a Cairo market taking some sheep to be slaughtered for Eid. Every where on the streets, alleys, and even large highways, animals were being transported to commemorate the sacrifice of Abraham. 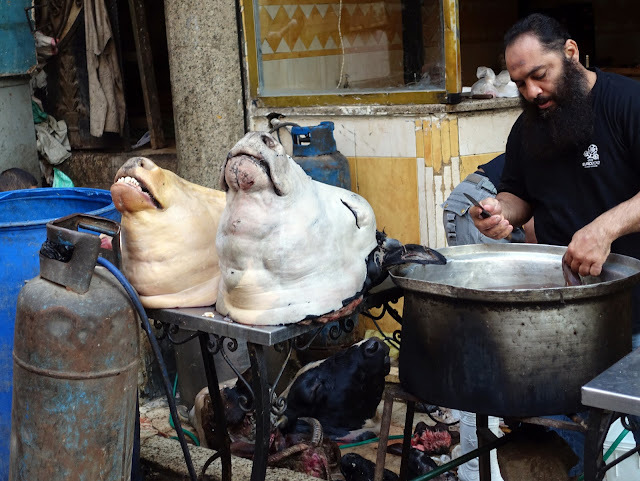 This scene is not for the faint hearted, but it was a common sight everywhere in the streets and markets in Cairo on the week of Eid. In the week before Eid, I visited some schools where they were teaching and preparing the children in their Islamic Studies classes for the holiday. 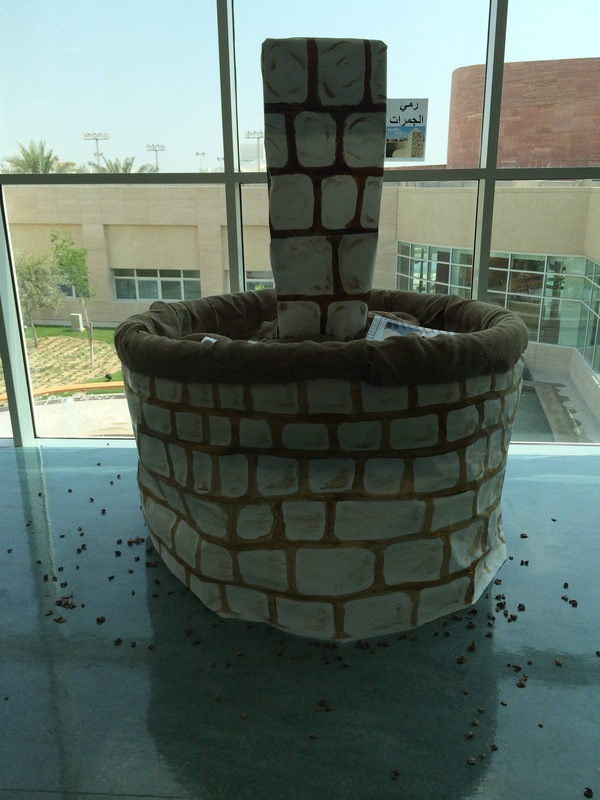 Since I have a son with autism, I happened to be at Awsaj Academy, a school for children with special needs, funded by the Qatar Foundation that serves mainly Qatari children. I was lucky enough to be at the school on the day the students were dressed up and reenacting the Hajj pilgrimage. These students have learning difficulties, including autism and Down's Syndrome. It was particularly touching to see the parents proudly looking on as their children reenacted the Hajj rites for them to see. This is my favorite picture of a mother or teacher pushing a child with special needs around a makeshift Ka'aba, the most holy site in Islam where the pilgrims walk around counter clock wise. When they are walking around the Ka'aba at Hajj, there are more people congregated in one place than any other place in the world. I found in my reading that the inner circle for walking at Hajj (closest to the Ka'aba or ancient cube) is reserved for an "express lane." This lane for walking or pushing is solely for people who have disabilities. The girls and boys were separated as they prepared to observe some of the rites of the Hajj. These young boys are preparing for Ihram, a spiritual state that requires different clothing. For this occasion, the men wear two white sheets with their shoulders showing. The girls cover everything, except for their hands and faces. Everyone is dressed in simple, humble attire, poor and rich alike. They must be washed and put on these robes before they come to the area for Hajj. The children were throwing balls at this makeshift cardboard well, memorializing the event when Abraham stoned the devil. The Qur'an teaches that Abraham was able to make the devil flee after he threw stones at him. You can see the kids haven't picked up the balls yet.... Ha! This is the Alabaster or Hanging Mosque in Cairo. 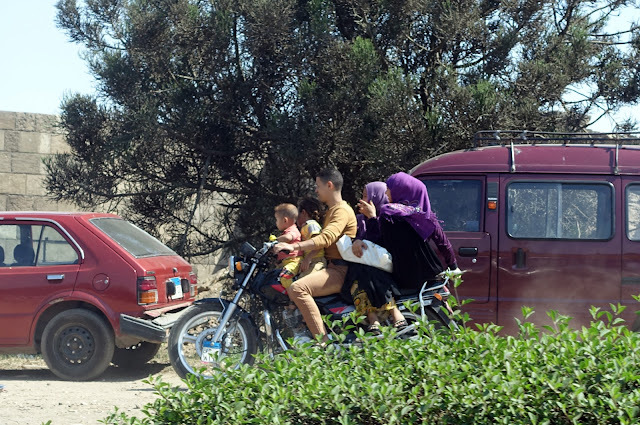 Large clusters of families could be seen everywhere, the young and old together, just visiting and going on excursions around Cairo. They continually greeted us, "Welcome to Egypt!" We were the only tourists around. I felt like Angelina Jolie for the next week. Everyone wanted a picture with us. Thanks, Lou! Your words mean a lot to me. Love you so very much! Miss you!